I haven’t forgotten you all, just lots of work to do! I have been tying at shows just about every weekend now for months, and I had Marc Petitjean hear for a week taking photographs for his new book on tying with CdC. I have now started work on my ‘Patterns for salt water sea trout’ book. It will include 50 patterns step by step and lots of new techniques and new materials. This is one of the first patterns photographed ‘The Hoodlum’ I am also finishing up four small books in the proven patterns series, Dry flies for grayling, Nymphs for grayling, Salmon flies and Flies for ‘other’ salt water species in Northern Europe. I will try and get back to my normal routine before long and start posting again. Have a great season and tight lines! A new date added to the calender. Next weekend I will be tying at the Rutland spring fly fair so if you are going please say hello! Uppingham Community College Sports Hall. I am having a spike right now on the site with visitors from Finland, and I would just like to say, I look forward to seeing you all at the Finish fly fair in April. Please visit me and say hi. For all my German friends. 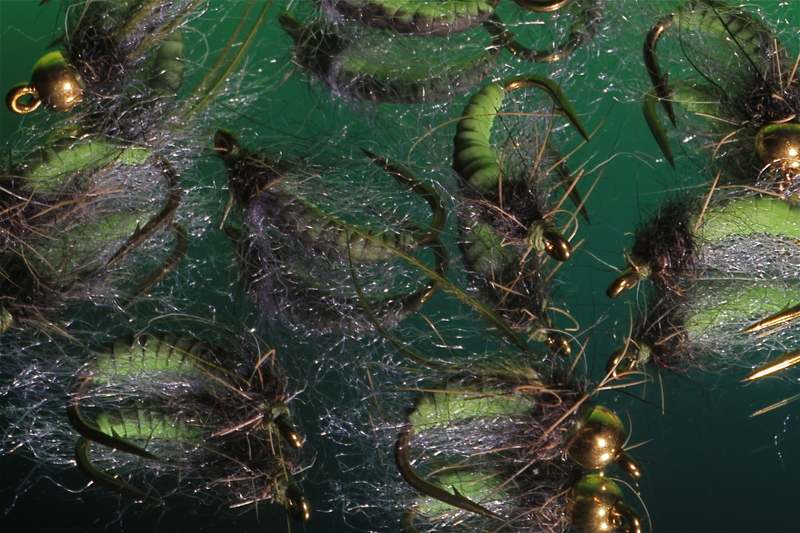 In 2014, I will have deliverd fly tying step by step articles for the the top German Magazine ‘Rute und Rolle’ every month for the past twenty years! In december this year they will publish a whole special fly tying issue, with over 40 of my step by step patterns and a free pack of five of my favorit Mustad hooks. A truly great weekend at the SIM Fly Festival in Castel di Sangro in Italy. I was honored, to become the ‘Norwegian Consul’ for the Scuola Italiana Di Pesca Mosca (The Italian Fly Fishing School) I would like to thank all my Fly tying friends, both old and new, for their inspiration, innovation and making this an unforgettable world class fly tying event! Today I will be mostly fishing with Royal Wulff’s! Have a fine and fishy weekend friends. UV Caddis Pupa. The difference is clear! 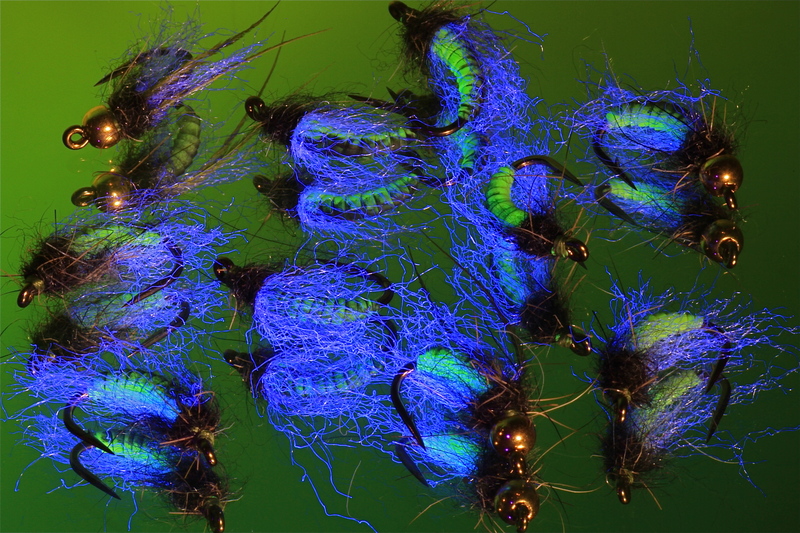 Here are some UV Caddis tied for fishing at the weekend in the mountain lakes in Norway. Although they look tasty with natural light, You can really see how they pop with the UV light. I cant wait to test them! I have My good friend Marc Petitjean visiting today so we will be tying and fishing over the weekend. I will post the full story and some nice step by step tutorials from Marc next week. Have a good one. Bound by a single thread! In the latest issue of Fly Fishing & Fly Tying you can see my full tutorial with Dyneema tying thread. Spinning, splitting, colouring and much more. I will be tying on Saturday 4 and Sunday 5 2013 at the Nordic fly fair in Elverum Norway. If you are around pop in and say hi. I look forward to seeing you there. A new and improved melt glue caddis pupa pattern that you can see the full step by step for in a coming issue of the US magazine Fly Tyer. I will be posting the full step by step later. I just had a few minutes to play around with the shrimp foils. This time I reversed the foil and tied it in back to front for a Gammarus shell. I’ll post the full step by step for this pattern later.